Rustic details drove, but did not define, the design of the kitchen in this new home designed by Gegg Design & Cabinetry. Details such as dark rustic beams, stone features and plaster walls exude a rustic feel, but the homeowners wanted cabinetry that did not feel overly traditional or rustic. 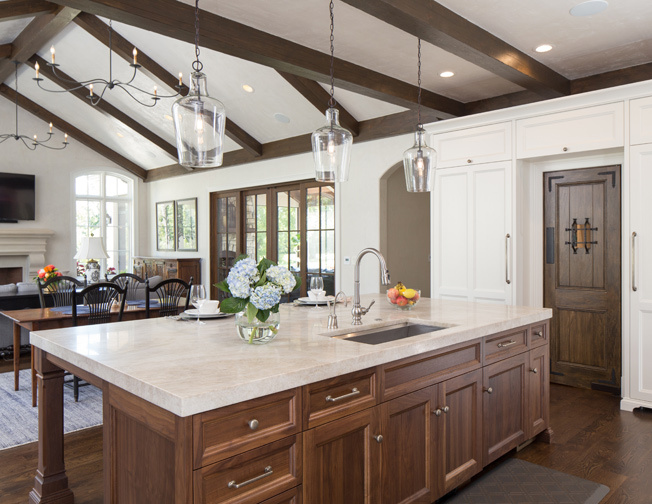 The solution was perimeter cabinets that are painted white with a walnut-stained island. The cabinet doors are one-inch-thick with a flat panel that was recessed as much as possible to give a bold feel. The pantry is accessible from the kitchen and located between the integrated 36-inch refrigerator and freezer. The pantry door was custom made and finished to match the walnut island. The door was also pulled forward to minimize the visual depth of the fridge and freezer. 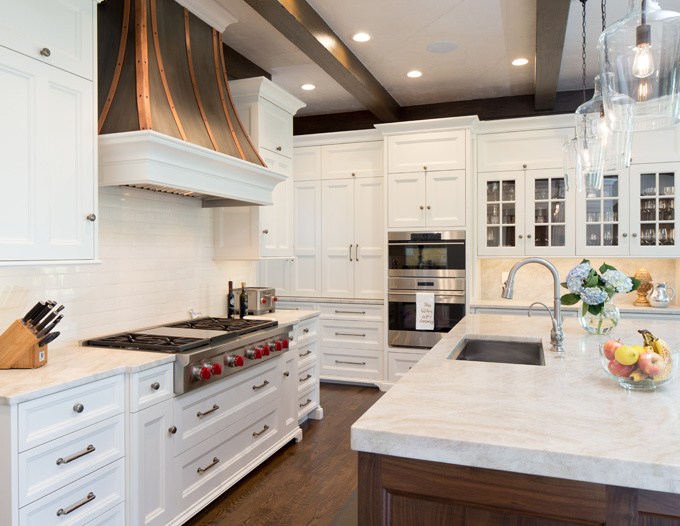 A custom handmade hood vents the range top, with the lower portion incorporating molding to match the cabinetry. The upper curved portion of the hood is made from steel with a light patina with solid copper accent straps and rivets. Deep wall cabinets to the left and glass front cabinets to the right flank a single convection oven with steam oven above. Accenting the glass cabinets are decorative pilasters extending to the counter, and this detail was also carried down to the base cabinets. The island is walnut with seating on three sides. A small coffee area, sink and microwave are tucked away in a corner of the kitchen. This new kitchen is well-balanced and highly functional. This kitchen is a showstopper with its timeless design. We love the custom hood, and the designer was smart to keep the fixtures understated to let the hood shine. How creative to finish the pantry door in walnut to seamlessly blend it into the space. This kitchen is timeless.